We’d love your help. 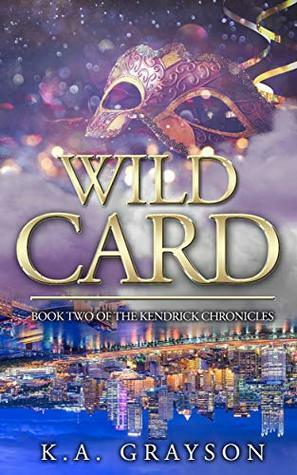 Let us know what’s wrong with this preview of Wild Card by K.A. Grayson. Reeling from an unplanned pregnancy that threatens to jeopardize her professional dance career before it even gets started, the last thing Rachel Kendrick feels like doing is attending a party. Especially one thrown on the anniversary of one of the worst nights of her life. However, this New Year’s Eve will be memorable for an entirely different reason. Will she keep her c Reeling from an unplanned pregnancy that threatens to jeopardize her professional dance career before it even gets started, the last thing Rachel Kendrick feels like doing is attending a party. Especially one thrown on the anniversary of one of the worst nights of her life. However, this New Year’s Eve will be memorable for an entirely different reason. Will she keep her center through a wild and tumultuous encounter or will she find herself fractured even more in its wake? Shawn Harrison is going to be a father; a fact that has him grappling with not only his own future but that of his girlfriend as well. When presented with a fast-track to the life of his dreams, will he push his band toward stardom or sacrifice it all to keep his family together? Or will Fate play a Wild Card? Known the world over for his voice, his music, and his indulgent, bachelor lifestyle, rocker Jason Andrade has one thing on his mind: Survive the last seven months of his World Tour. With an invite to a party to soften the blow of yet another New Year’s on the road, a run-in with a beautiful, young fan could present him with more than he expected. Has the charismatic singer finally met his match or will he run from the very thing he thinks he can’t have? To ask other readers questions about Wild Card, please sign up.